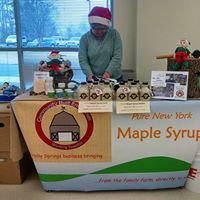 We are a North Carolina based business currently bringing fresh maple syrup to farmers markets in the Holly Springs area. We travel to NY each winter to tap maple trees on our family farm, and work with other small producers in the area to turn that sap into high quality maple syrup. The trick is doing the work ourselves and working small batches.